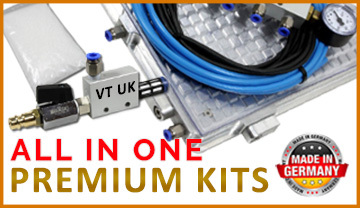 Our premium vacuum kits are the best value, best quality All In One vacuum solutions on the market. There's no need to buy an expensive vacuum pump, all you need in addition is a compressor capable of producing 45 litres per minute of clean air at 5 bar of pressure and that’s it! You'll be up and running in no time once your kit arrives. Simply fix your vacuum table to your T slot by attaching the existing clamps on your machine to the lip around the bottom of the table. Add the airline to the vacuum generator supplied, remove one of the grub screws from the surface of the table, create a seal with the cord supplied, place your part ready for machining and turn on the compressed air. It's that easy - you’re good to go! With only a low requirement on the compressor, even a basic home workshop compressor will work with these kits. What's Clamping Force Booster (CFB)? CFB is an innovative new product that we supply with our kits to increase vacuum holding force for parts that are usually too small for a vacuum table or that have an irregular shape. 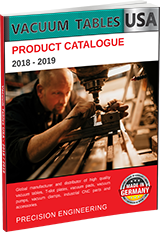 Not only are these kits precision machined from tempered cast aluminium, they are also significantly better value than similar products from our competitors. With various sizes available you can be sure to find a table to fit your budget and machine size. Need help choosing the right product for you? We’re here to help. With real time online Live Chat support you can be certain that your questions will be answered quickly. You can also email us direct and we usually get back to you in just a few hours. Our 3020 RAL Premium vacuum clamping kit contains all you need to get started with your CNC vacuum clamping project.This kit features our premium RAL Series 3020 vacuum table and all accessories you need to get started.Our premium kits include:1 x 3020 RAL Series vacuum table1 x Venturi VT-VE1 vacuum generator1 x Clamp..
Our 4020 RAL Premium vacuum clamping kit contains all you need to get started with your CNC vacuum clamping project.This kit features our premium RAL Series 4020 vacuum table and all accessories you need to get started.Our premium kits include:1 x 4020 RAL Series vacuum table1 x Venturi VT-VE1 vacuum generator1 x Clamp..
Our 4030 RAL Premium vacuum clamping kit contains all you need to get started with your CNC vacuum clamping project.This kit features our premium RAL Series 4030 vacuum table and all accessories you need to get started.Our premium kits include:1 x 4030 RAL Series vacuum table1 x Venturi VT-VE1 vacuum generator1 x Clamp..
Our 5030 RAL Premium vacuum clamping kit contains all you need to get started with your CNC vacuum clamping project.This kit features our premium RAL Series 5030 vacuum table and all accessories you need to get started.Our premium kits include:1 x 5030 RAL Series vacuum table1 x Venturi VT-VE1.5 vacuum generator1 x Cla..
Our 5040 RAL Premium vacuum clamping kit contains all you need to get started with your CNC vacuum clamping project.This kit features our premium RAL Series 5040 vacuum table and all accessories you need to get started.Our premium kits include:1 x 5040 RAL Series vacuum table1 x Venturi VT-VE1.5 vacuum generator1 x Cla..
Our 6040 RAL Premium vacuum clamping kit contains all you need to get started with your CNC vacuum clamping project.This kit features our premium RAL Series 6040 vacuum table and all accessories you need to get started.Our premium kits include:1 x 6040 RAL Series vacuum table1 x Venturi VT-VE1.5 vacuum generator1 x Cla..